Hi! I’m Mallory and I write Charming In Charlotte, it’s so nice to be here today. Isn’t Britt a doll?! We connected through Instagram a few months back and upon learning that she’s a fellow Louisiana gal and LSU alum, I kinda loved her right away. 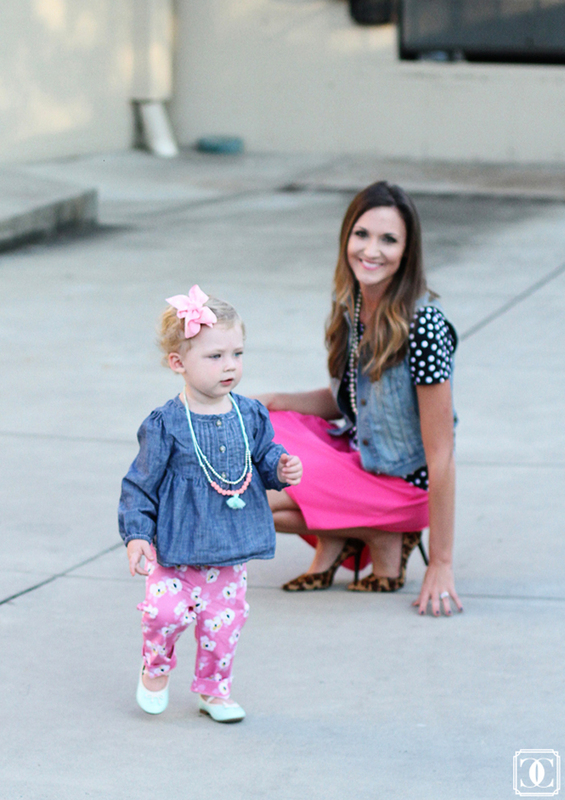 She asked me to share some Mommy + Me fashion with you guys today, so here we go. I started Charming In Charlotte to document this adventure and serve as a journal to our friends and family in Texas and Louisiana. It’s now turned into SO much more and is my little place to stay creative and stay as fashionable as a toddler mom (who likely has avocado either somewhere in my hair or on my clothes daily) can. 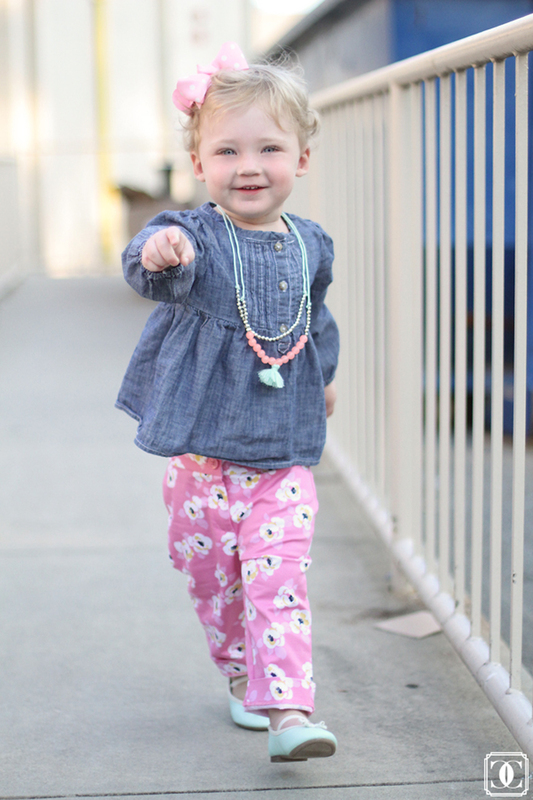 I started our What We Wore series in May because I have such a fun time dressing our daughter. It’s even better than I expected. I wanted to remember all of these little outfits and I also wanted to use the series to document how quickly she grows and changes. It’s become one of my favorite posts each week and I plan to make a book for her with all of the images at the end of the year. We act silly, we say cheese, and I chase her….mostly I just chase her. It’s awesome. The premise is that something between our outfits ties them together for each post. Today we are transitioning our bright pinks for Fall (so that we can still wear them to support kicking Breast Cancer’s Booty) and I am layering up Southern Style for October (which we all know is still HOT). My skirt is actually a sleeveless dress from Old Navy, layered with a fitted tee, topped with a denim jacket and I added another fun play on pattern mixing with the leopard heels. 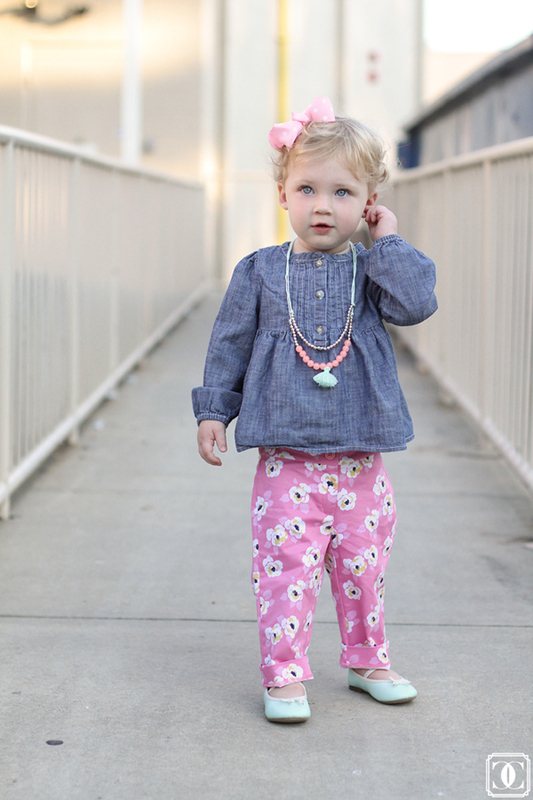 Landry Kate has on her printed pants from Janie and Jack’s spring collection with a really light chambray swing top and too cute tassel necklace both from Carters. Her mint green ballet flats are a fun pop of color. See below to shop the outfits! Britt, thanks again for having us here and letting us run around on your beautiful blog. I hope that you guys will come visit us at Charming In Charlotte sometime and say hello or you can follow us on Instagram for a daily dose of random fun! Her sweet little Mary Jane’s make me swoon. Do adorbs. These photos are absolutely adorable! Love them! How Cute! I love the patterns in both outfits! Too cute! 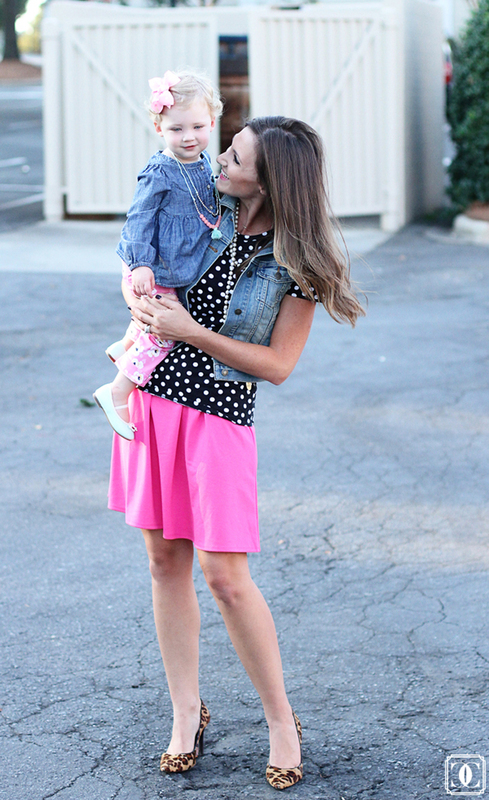 I LOVE the pop of color in your skirt and the more subtle pinks in your daughters. Very hip and classy! Aww! Things like this make me wish I had a little girl, too! Love the outfits. 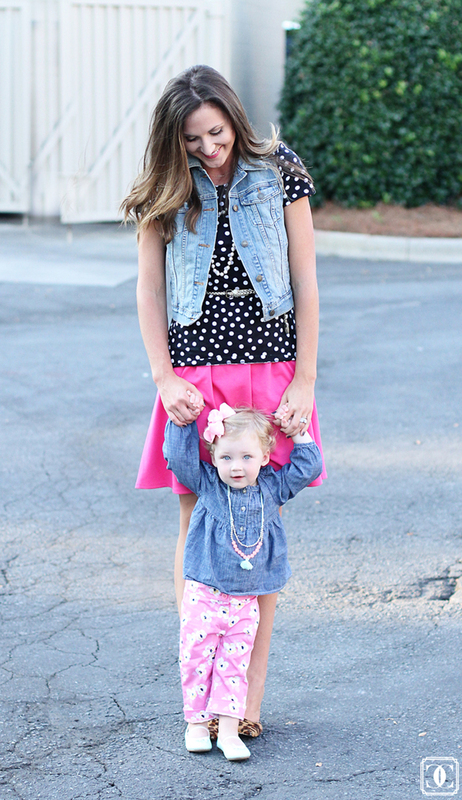 Especially the denim and pop of pink! Too cute! Adorable little girl and pretty clothes. Love when little girls get into jewelry! It’s adorable. 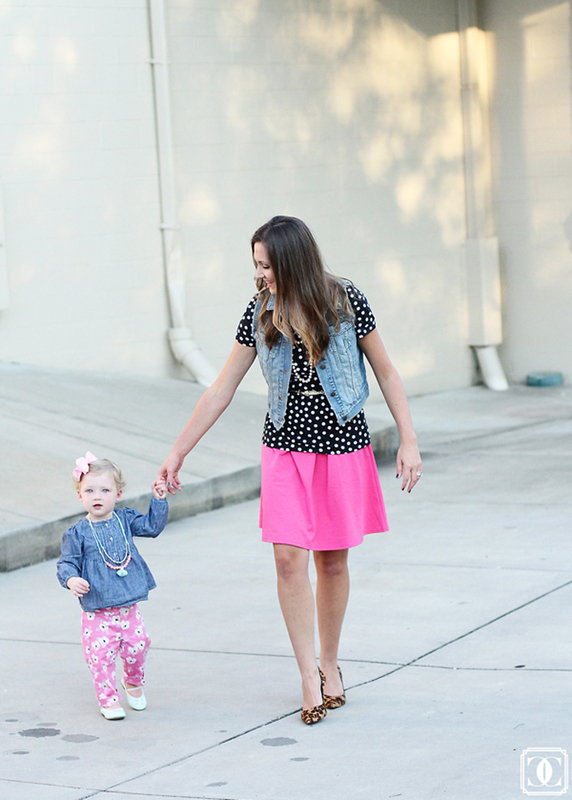 Loving you pink skirt with the polka dots! Love this so much! The outfit, the jewelry, the hair… so adorable! Love this precious duo and your site is gorgeous!!! Following! I’m loving Landry Kate’s shoes! So cute.